So cod and codling will be flavour of the month and I suppose the first question to resolve is the old chestnut of when does a codling grow up to be a cod? I don’t know of a clear dividing line, but in my book a 5lb fish is still a codling while a 10lb fish is a cod so it must be somewhere in between. I’ll let you decide. Inshore cod tactics vary widely from drifting with pirks and hokkais in relatively clean and clear water to shallow water uptiding in a sea that can sometimes resemble the proverbial pea soup. I am going to focus on the Hampshire way and that means fishing at anchor in a generally discoloured sea. Last issue I highlighted how the seasonal demise of the mackerel causes anglers to turn to squid as a key bait source, while still targeting a number of species – bass and cod included. But by November the main difference is that our bass are in decline while cod are in the ascendancy. I am quite prepared to be controversial so from the outset I will say that cod are actually failry easy to catch. That will be precious little consolation to anyone (myself included) who has sat for hours waiting for a bite, but the simple truth is that cod have evolved into marine vacuum cleaners that gobble down almost anything edible. 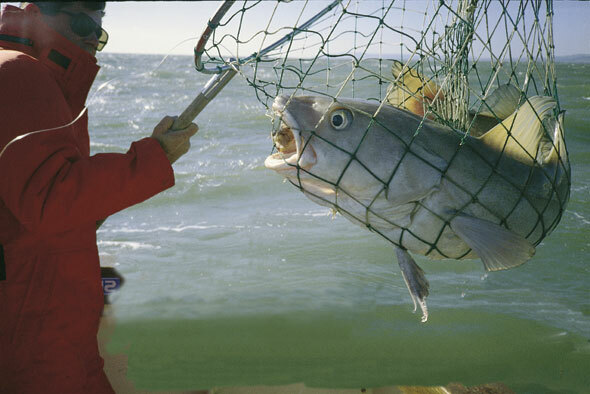 Offer a decent bait in the right way where cod are feeding and you will catch. However, make a simple or basic mistake and you can still remain fishless. 1. Choose the correct technique and rig for the venue. 2. Fish the right bait or lure. 3. Identify the right time or state of tide for a given mark. 4. Select the right mark. Now all of a sudden it does not sound quite so easy. 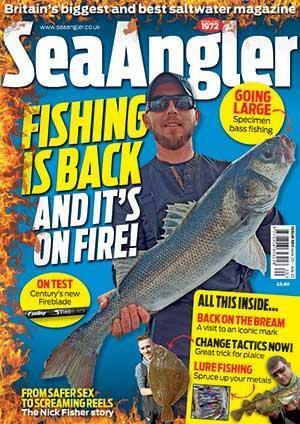 As an angler you must interpret or read the situation in order to make the right choices and maximise your chances. Let me talk you through the choices for my local patch. Hampshire cod, taken off the Needles or the Nab Tower or through the Solent, are feeding in dirty water. They are unlikely to be in predatory mood as they cannot see or sense small prey easily in these conditions and are therefore more likely to be grubbing on the bottom. When you gut these cod they may contain small fish (pouting, whiting, dragonets etc) but they are equally likely to be stuffed with crabs, squat lobsters and other crustaceans. They are basically in heads down Hoover mode. To catch these cod we have learned that we must be at anchor. Stationary baits presented on the bottom are essential. Both downtide and uptide techniques work well. Running leger rigs are preferred, while shorter traces beat long flowing rigs that let bait flutter way off the bottom. Keep to six feet or less. I am coming to bait shortly, but for downtide rigs I like to present two baits with larger bait on a two-hook Pennell (a couple of size 6/0 hooks or bigger according to bait size) plus a size 4/0 dropper off a three-way swivel about 18 inches below the lead. For uptiding go for relative simplicity with one bait on the Pennell rig. The paradox is that we fish big baits that do not form part of the cod’s natural diet. I explain this by drawing a parallel with tempting kids away from boring routine food with a big bar of chocolate. Why compete against natural hardback crabs when we can tempt the fish with scented offerings of fresh squid, lug and peeler crabs. They ought to think all their Christmases have come at once. We know these baits work superbly so go for it! Relating baits to rigs, I put the large squid bait on the Pennell. Be prepared to use two squid or even more. Cod have huge mouths and appetites. I have a great deal of faith in lugworms as a cod bait and attractor - even for the bigger fish. When downtiding I like to pile a few lug onto the upper hook of the rig and maybe tip it off with a small squid head. It is amazing how many cod have taken that rather than the main offering. Peeler crabs are excellent for cod, but beware dogfish. Hampshire waters in November can appear to be more like kennels, so if you want to concentrate on cod don’t promote your doggie prospects. This can be slightly more difficult. From experience I know of east Solent cod marks that are all but useless on the ebb tide in comparison to the flood – and vice versa! Very few marks fish consistently all day or fish the same on spring and neap tides. Cod do seem to like tide to promote feeding. There is a fairly well established theory that in these bottom-feeding conditions they head into the tide, but actually use the tide to cover ground by slowly but steadily move backwards down the tide. This being the case when the tide is strong they will have to work harder to slow up their movement in order to feed. When the tide is weaker they will equally cover less ground. There are three separate pieces of evidence to support this theory. Firstly a common big cod encounter may comprise a bite and accompanying backing off as the fish continues to drop back down the tide. Secondly it is not uncommon for a boat uptide to intercept fish before the others and thirdly marks that fish well for cod at the end of one tide usually have another pulse of fish on the pick of the next tide as they return. I would be interested to hear your comments or experiences of this. The bottom line is that each mark is likely to fish slightly differently and a measure of experience is needed. If you are fishing a new area it is worth being guided by the locals. If there is a small fleet of boats covering a particular area be positively suspicious... and if they all move as the tide changes be even more suspicious and see where they go. The ground that cod are looking for has to support a mixed ecosystem of marine worms, crustaceans and small fish. The extremes of clean sand and rock will not be as supportive as a mixed gravel bottom with small stones and the like. This sort of marine environment also thrives where there is variation in depth and structure that affords protection for small fish. Look for this type of sea bed between rocky areas or reefs. Look for depressions and gullies or the harder ground at the base of banks. Obviously there is another factor that greatly improves catches in shallower water, which is night fishing. I have little evidence to suggest that catches are dramatically improved by fishing after dark in the deeper spots over 100ft, but darkness is a factor. Ultimately when you have sussed out the right marks, correct stages of tide and adopted the killing tactics with the best bait you find that cod fishing is easy... provided the cod are actually there in the first place. WANT MORE COD TIPS, TACTICS AND NEWS...? We are regularly updating our Cod and Codling page, where you will find links to the latest tips, tactics, news and marks relating to Britain's most popular sea fish. You will find it by clicking HERE.